If you thought the only ingredient in your wine was crushed grapes, you may be in for a surprise. Winemakers love to spin romantic tales about the climate, soil, and tradition behind their wine, but strangely omit the part about fish bladders, egg whites, and clay. Those are just a few of the unexpected things that might come in contact with wine before you drink it. Before you rush to the sink to pour that bottle you just opened down the drain you should know these things don’t remain in the wine you drink. Most additives are used in tiny amounts to smooth out minor flaws in a wine, and then removed completely. Though in some cases they may remain in the wine if the goal was to cover up larger mistakes like poor fruit quality/taste. Unlike most food and drink for sale, wineries aren’t required to list ingredients on the bottle. If wines were labeled like potato chips, you might do a double take if you picked up a bottle and saw things like gum arabic, egg whites, acetaldehyde, charcoal, or fumaric acid. Those are just a few of the 70 additives approved by US Alcohol Tobacco Tax Bureau . Ridge takes a non-interventionist approach to winemaking and offers transparency in labeling the few ingredients that go into their wine. Adding certain things to wine isn’t new. Winemakers have been using common additives in production for hundreds of years. They fall into six general categories: anti-oxidants, tannins, acidifiers and de-acidifiers, clarifying agents, and stabilizers. The most known and often misunderstood, sulfur is an anti-oxidant used to kill bacteria and prevent oxidation in wine. A very small portion (around 1%) of the population has severe sulfite allergy which is why producers include the “contains sulfites” message on labels. 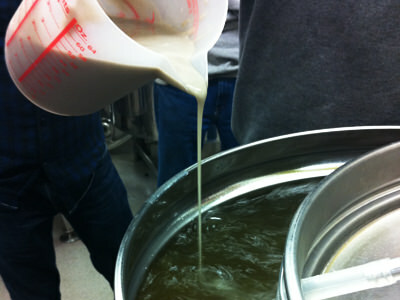 A basic and necessary component in winemaking, yeast converts sugar to alcohol, but different strains of yeast can dramatically impact the flavor of wine. Some winemakers swear by “native” yeasts, basically whatever’s hanging out in the vineyard or in the cellar, while others only use “cultured” yeasts which offer much more predictable results. Winemakers might add sugar during fermentation in a process is known as “chaptalization”. It’s not designed to make wine sweeter, but rather used to increase alcohol levels. This is more common in areas like Bordeaux and Oregon, where grapes often struggle to fully ripen. In CA, Italy, and NZ however it’s illegal to add sugar to wine. Egg whites, Isinglass (aka dried fish bladders), and milk proteins are a few additives commonly used to clarify wine. After wine is fermented it goes through a clarification process known as “fining and racking”. Egg whites have traditionally been used to bind to any tiny particles floating around in the wine and are removed entirely after they drop to the bottom of the barrel. So don’t worry, you aren’t drinking fish bladders and eggs in the finished product. Strict vegans will be happy to learn that non-animal additives like clay can be used. Some winemakers take a non-interventionist approach. In this case you might see “unfined” and “unfiltered” on the bottle. In that case, don’t be surprised when you find a small pile of sediment in the bottom of your glass (or in your mouth!). If you’re curious about what else might be allowed, here’s a complete list of approved additives in all their scientific glory. Regardless of winery size, producers can’t really get around using the sulfur, yeast, enzymes and bacteria to make wine. But there is one polarizing ingredient that shows up way more in two buck chuck. It’s called “Mega Purple”. It might be illegal to add sugar to wine, but producers can add grapes high in sugar content, like Alicante Bouschet or Petite Sirah. 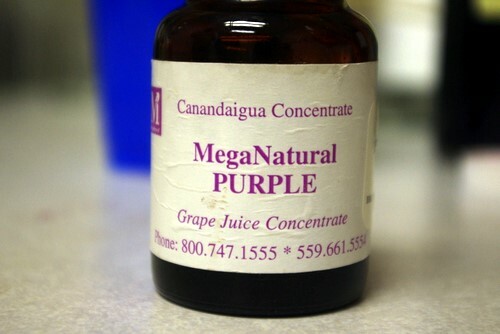 When you’re producing a million cases of wine, you might look for cheaper options and a small dose of super concentrated Mega Purple makes wine sweeter, adds a bit of texture, and covers up flawed flavors. There’s nothing unhealthy or inherently wrong with using Mega Purple. Large producers place a priority on uniformity, not complexity. Most small scale winemakers take pride in creating expressive and unique wines that reflect the nuances of a growing region or a certain varietal clone and adding Mega Purple puts them at risk of making a wine that masks the true character of their wine. Manipulating a wine with something like Mega Purple pales in comparison to what some wineries have been caught doing. In 2004, winemakers at the KWV winery in South Africa decided to add vegetable flavorings to several of their Sauvignon Blancs in an effort to inject the expected aromas of green pepper and grass. It worked, and the wines racked up several awards before the fraud was discovered. A few years earlier, the Australian winery Kingston Estate was caught exporting wine containing trace amounts of the silver nitrate, a toxic salt. It was added in minute quantities to hide a sulfurous rotten-egg smell in the wine. Several shipments made their way to the United States, but were caught and impounded. Luckily these incidents are few and far between. On the opposite end of the spectrum you have producers like Bonny Doon and Ridge who proudly display ingredients on their wine labels. They believe wine should reflect its terroir, and think heavy manipulation takes away from the wine’s authenticity. You’ll find strong opinions on either side of the debate. 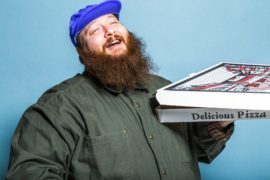 Some critics like Alice Feiring proudly voice their support for “natural” wines free of sulfites and other additives, claiming these wines are purer and more eco-friendly. Others dismiss their claims as a radical-chic trend that doesn’t even have a concrete definition of what “natural” means. 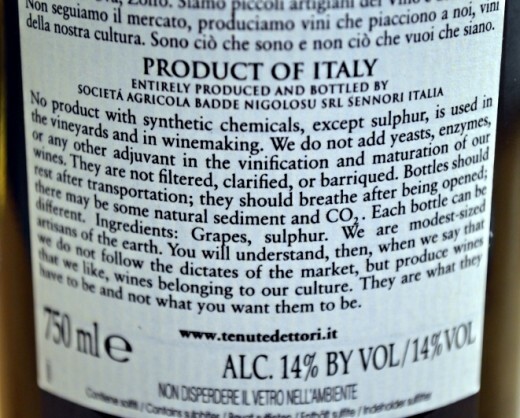 This Italian producer makes it very clear their wine is as natural as can be. There’s a line between minor adjustments and larger scale manipulation. It’s safe to assume less intervention translates to a better reflection of the vineyard, the varietal, and the vintage. But even if you’re swigging on a cheap blend of Mega Purple and Merlot it’s safe to assume your innards won’t rot away. As a consumer walking down the wine aisle it doesn’t hurt to understand the different approaches to winemaking, but ultimately you should let your own taste dictate what you like to drink.